When setting up a list, you’ll need to decide: single or double? Opt-ins, that is. A “single opt-in” means that when someone puts their email address into your signup form and hits the submit button, they’re added to your list without further action. A “double” or “confirmed” opt-in means that when they hit submit, it generates a confirmation email with a link in it that the subscriber has to click on to activate their subscription — or they won’t get on your list. Now, it seems like it would be much better to do the single, right? You’ll get more people on your list that way. And heck, you can add a bunch of people yourself that way, such as when someone gives you their business card. Great, right? Wrong! That last idea should give you a clue as to why you don’t want to do a single opt-in: anyone can add anyone’s address. I used to monitor how my subscribe form was used, and I could see when someone was trying to harass someone else: they’d put an address in and hit submit — and then back up and hit submit 20, 30, even hundreds of times. They were hoping that their victim would get a ton of junk in their mailbox. If you had a terrible ESP, maybe they’d get added to the list dozens or hundreds of times and then get dozens or hundreds of emails per week. They were trying to use me and my resources to spam someone else. I certainly didn’t want any part of that, and neither should you. And yes, this happens — a lot. That’s not the only reason to use double opt-in, however. Sometimes people typo their address. Why pay to send messages to a bad address? Or, worse, to a real address that someone else actually uses. Are they going to hit the “Spam” button when they get your unsolicited mail? Heck yeah — and that will hurt your reputation and, by extension, deliverability. If a potential subscriber really wants your mail, they’ll click a confirmation link. Plus, it’s a quick reminder that they did, in fact, want to subscribe, which helps cement your identity in their mind: yes, you’ll be emailing them. That’s what this is about. And when you have confirmed opt-in set on your list from the start, your ESP will know it, and is much more likely to be on your side when someone does hit the “This is Spam” button (and some subscribers will, even when they can’t get onto your list without confirming, and even when they’ve replied to your messages saying how helpful they are). Confirmation prevents people from falsely subscribing others to your list. Confirming cements commitment, and reminds readers they wanted your info. Double opt-in gives you proof that all subscribers did request their subscriptions, protecting you from false spam complaints. And it ensures the best possible deliverability for your messages. So even if your ESP allows you to use single opt-in, it’s a bad idea to use it. Besides the solid arguments you noted, there is another reason to avoid single opt-in – regulatory compliance. Some countries practically require a double opt-in process. I’m USA based, but I have some customers and newsletter recipients in Canada. In 2014 Canada’s began phasing in the CASL legislation outlawing the use of implied permission. Email recipients in Canada must explicitly agree to receive emails from a commercial enterprise. Sending mail to an unconfirmed Canadian recipient is a violation. In these days of global commerce it’s not easy to tell where in the world a subscriber might be when they receive their emails. 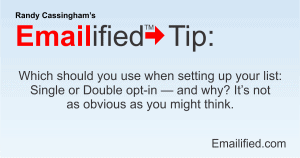 Better to be safe and use double opt-in for everyone. That provides documented proof of subscriber intent should the authorities ever come calling.